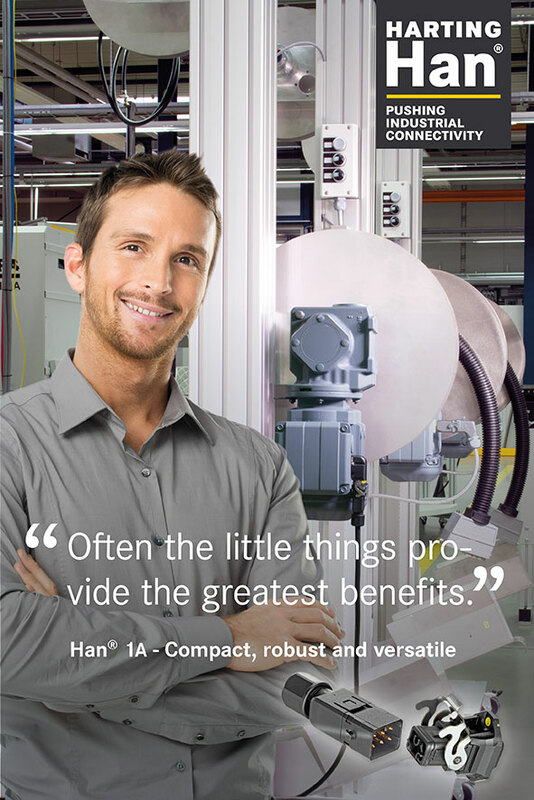 Han® 1A: The compact, robust and economical connector for controllers, small drives and control cabinets. Increased miniaturisation in the machine/facility construction sector is also occurring in harsher industrial environments. 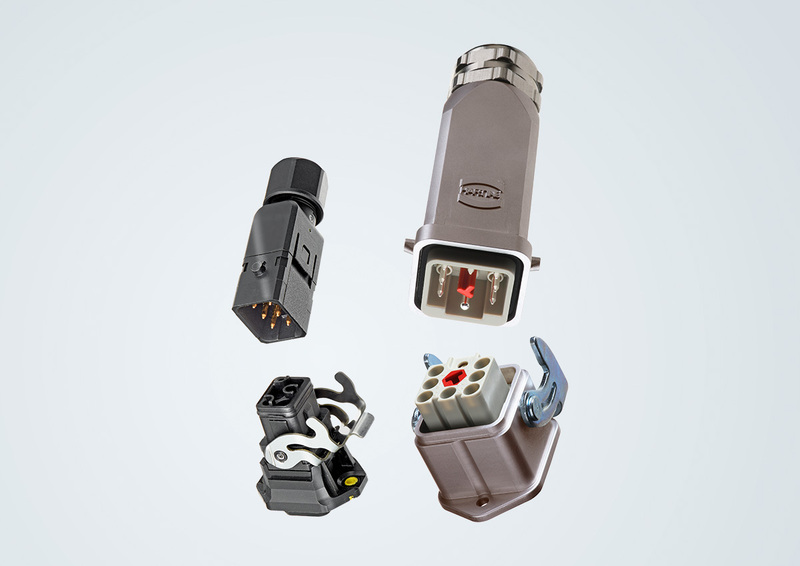 Compact and versatile – yet still robust – industrial connectors are in demand. For the first time, HARTING's Han® 1A offers a compact, affordable power connector, which can be used for controllers, small drives and control cabinets, and can also be installed in the field. The new industrial connector is made of high-performance plastic. It is lightweight and takes up minimal space, since it is much smaller than the next smallest rectangular connector, the Han® 3A. In the field of machinery construction, the Han® 1A is used to connect tools and modules efficiently, including heating or cooling units, fans, control terminals, lighting systems, drives and vibration conveyors. It is suitable for IP20 connections in control cabinets as well as for outdoor requirements, because it achieves IP65 protection in the locked position. The Han® 1A is a compact and very robust rectangular connector featuring up to twelve contacts that can transmit data, signals and power. Given its modular construction and range of different uses, it is particularly suitable for use in areas where a supply is needed for multiple small drives, sensors and devices. A clearly structured connector system based on a few basic components simplifies material supply, as a plug-in connection consists of a maximum of twelve different contacts. Thus, the Han® 1A offers a wide range of possibilities whilst minimising your supply inventory. The Han® 1A is a rectangular alternative to circular connectors which is robust and easy to install. It is ideally suited for connecting devices on the periphery of production facilities, as well as for supplying tools and smaller machine modules. Its Snap-In technology eliminates the need for a time-consuming screw connection. Even if several connectors of the same format are installed in parallel, there is no danger of confusion. With its coloured coding clips, the user can only plug-in the matching connector sides. I am from Shenyang Machine Tool Co., Ltd. Our company is the biggest supplier of metal-cutting machine in China, which is our core business. We have been cooperating with HARTING for a long time and we are very happy with HARTING’s products, quality and after sales service. We look forward to our comprehensive and long-term cooperation in the future. We aim at providing better service to our customers. I am from Xi’an XD Switchgear Electric Co., Ltd, which is the subsidiary of China XD Group Corporation. Our company manufactures, develops and produces high voltage GIS. At the moment, XD Switchgear has 3,000 employees. HARTING provides efficient products and solutions for us during our cooperation. I am extremely grateful to HARTING. I look forward to our comprehensive partnership in the future. Are you interested to save space with Han® 1A? Request your free sample to get a first impression of your benefits.